Sean told me in Amsterdam that he wasn’t sure he’d want 40 percent of all trips in Seattle to be taken by bicycle. When you bike in Seattle you feel like you’re part of a subculture. Biking makes you stick out a little bit and—like being a vegetarian, for example—people occasionally want an explanation for why you showed up on a bike. Biking in Seattle can also be a thrill because not everyone is doing it. It can be a subtle way of rebelling against mainstream American culture and even the risk factor that comes with biking in Seattle is appealing at times. I understand Sean’s point. We all have different ways of expressing ourselves and the self-defining quality that biking offers in cities where biking is uncommon is a legitimate motivator for a subset of cyclists. Cycling in Amsterdam is so omnipresent and normal that it says almost nothing about your character or values. When Sean and I left Amsterdam we stopped at the fietsdepot (which means bicycle depository in English). 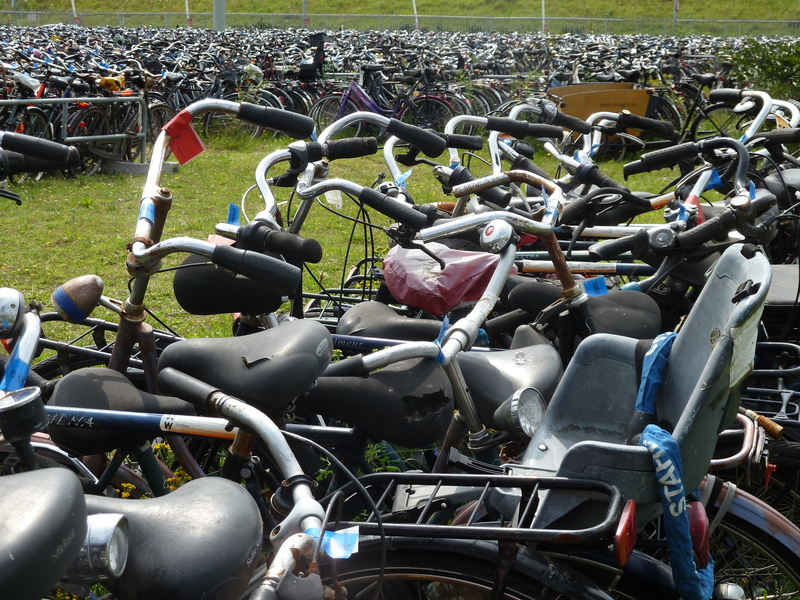 A few people had suggested I go here and had referred to it as the bicycle graveyard of Amsterdam. Bikes in Amsterdam end up at the fietsdepot if they have been parked illegally or parked in the same place for too long. Stolen bikes that have been stripped of parts and abandoned also are sent to the fietsdepot. I met Roos and one of her friends for coffee on Saturday morning and they explained that a trip to the fietsdepot was one of the most dreaded errands of Amsterdammers. 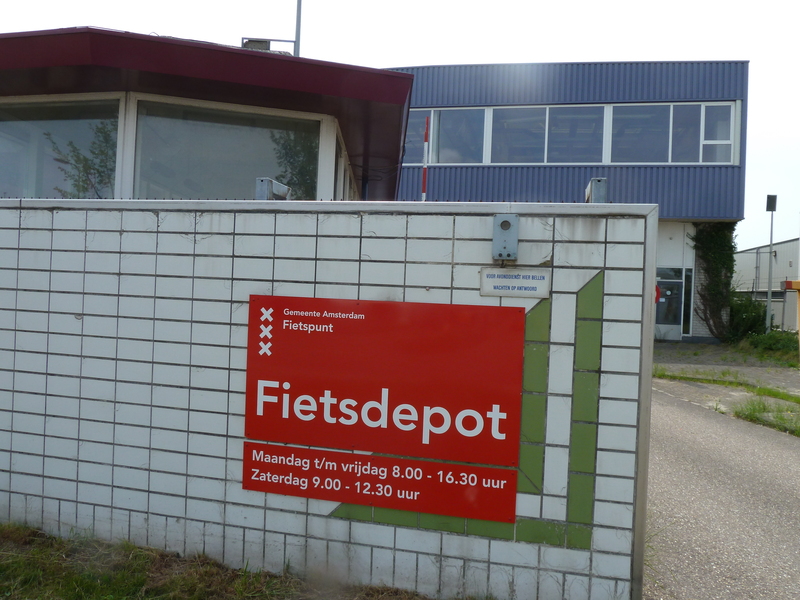 The fietsdepot is pretty far away from the city center in a very industrial area near the airport and smells like it is also near the city’s garbage transfer station. The manager of the facility was curious about why I was taking pictures and spent about 10 minutes talking with us about how the fietsdepot works. Roughly 40,000 bicycles come to the fietsdepot each year. Bicycles that have been parked for too long in one place or that are parked illegally are tagged to give owners an opportunity to move their bike. A red tag indicates that your bike needs to be moved or else it will be towed to the fietsdepot. If the bike isn’t moved after a few days the police department will clip the lock of the bike and transport it to the fietsdepot. Every year about a third of the bikes at the fietsdepot are reclaimed for a fee of 10 Euro. Most bikes in Amsterdam are engraved with a unique identification number in case the bike needs to be claimed at the fietsdepot or reported stolen. If a bike isn’t claimed after three months then it is either auctioned off to bike dealers, donated to various non-profits who train at-risk youth to retrofit bikes, or sent to the scrap metal yard. 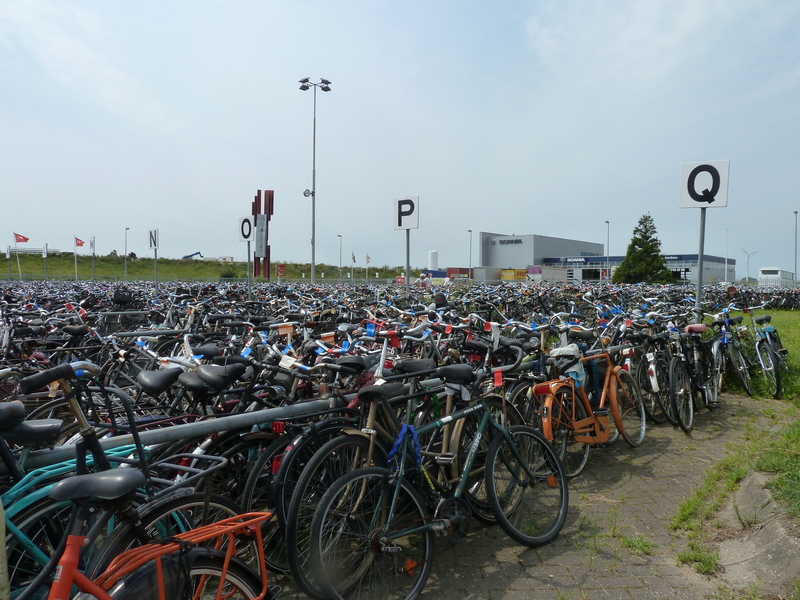 The fietsdepot and the massive bicycle parking structure near the central train station were impressive to me because I’d never seen so many bicycles all in one place. These facilities made me think of the expansive parking lots of American malls, airports, and office parks. I did a little research on parking and found that the space needed for vehicular storage in the United States equals, if not exceeds, that for vehicular movement. 1 In other words, parking lots take up almost as much space as our network of roads. Bicycle parking also consumes plenty of space, but you can fit between 10 and 15 bicycles in one car parking space. 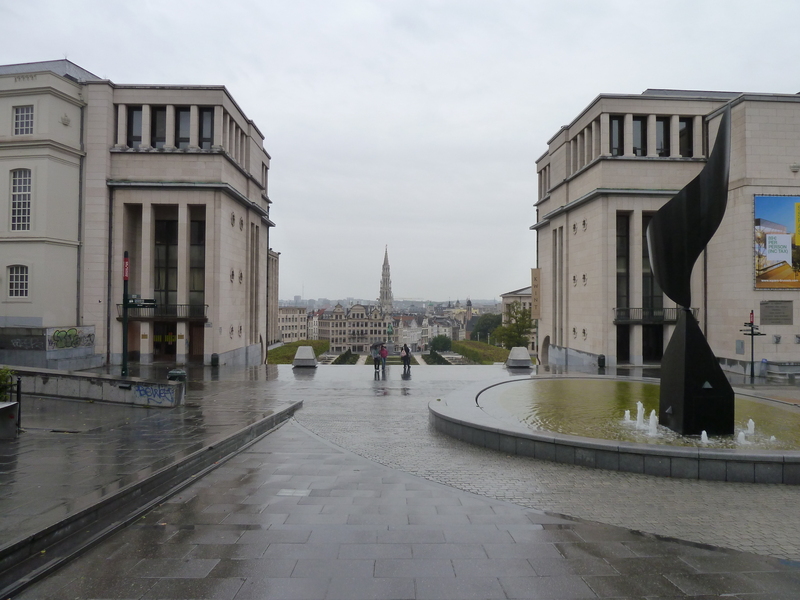 Our first day in Brussels was cold, wet, and dark. There were almost no other cyclists on the roads and as we cycled on the hilly, wet cobblestones with cars anxiously passing us I felt my defensive edge reemerge. 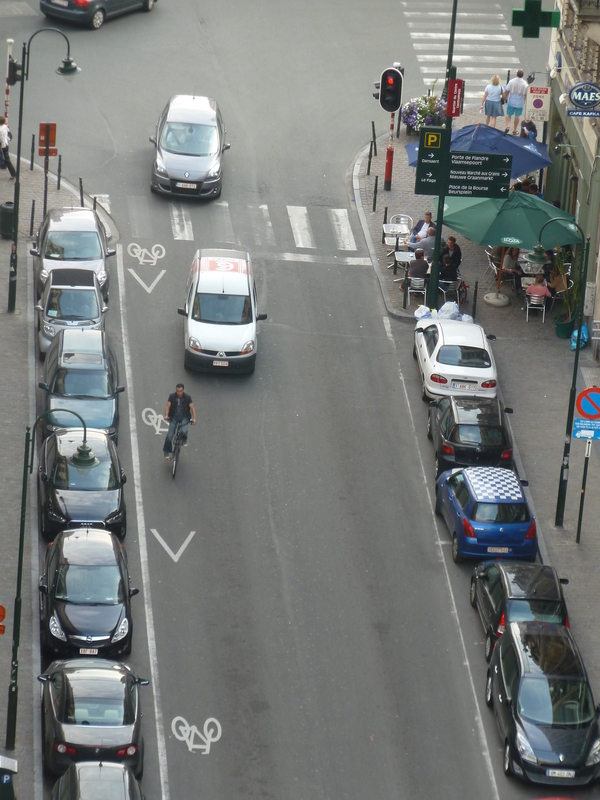 The car-clogged streets of Brussels were a harsh reminder for me that cycling is not mainstream in most urban centers. Immersing myself in the bicycle cultures of Copenhagen, Groningen, and Amsterdam for the last month and a half allowed me to observe and experience the possibilities cycling offered to the urban landscape. The lonely cyclists of Brussels reminded me how much work there is to be done to fully realize those possibilities in most cities across the globe. I was experiencing a slight case of bicycle culture shock. Friday was sunny and we saw more cyclists on the road—nearly all of them clad in reflective vests and wearing helmets. 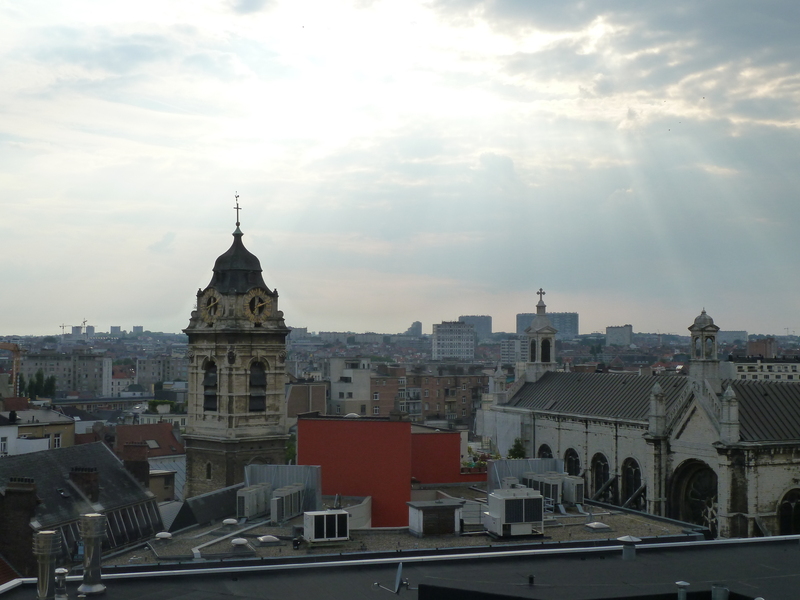 Sean and I spent most of the day cycling through Brussels and I realized that—to a certain degree—there was also something I liked about being one of the only cyclists on the road. I biked faster, I was more aggressive, and I was a lot more alert. I also realized that I was having fun and that I had missed the style of city biking that I had learned in Seattle. I’m hopeful that more and more cities will begin investing in the appropriate infrastructure to make cycling mainstream, but I realized in Brussels that until then I’m going to enjoy being the outlier. Funny that Sean used to want everyone to bike here in Seattle. Has this changed his mind at all? hope you guys are having a great time!